In today’s highly complex digital landscape, organizations face multiple IT risks ranging from cyber breaches and IT hacks, to a failure of IT assets due to technical issues. Identifying critical assets, and adopting a risk-based approach towards analyzing potential threats is essential to understand your organization’s risk exposure -- be it from a financial, competitive, reputational, or regulatory standpoint. 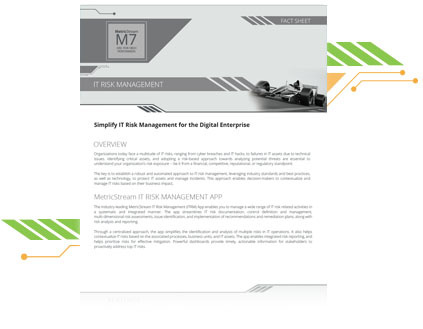 A robust IT risk management program leverages industry standards and best practices to protect IT assets and manage incidents. For effective risk management, decision-makers require the right tools to contextualize and manage IT risks based on business impact, rather than assessing risks in isolation.